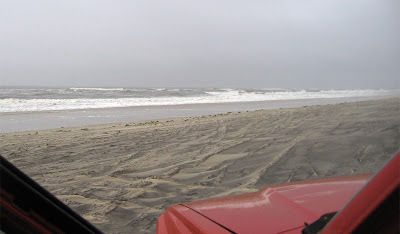 Bill's OBX Beach Life: You Missed IT! !, Weekend Wavesailing Score at Coquina Beach AGAIN!! You Missed IT! !, Weekend Wavesailing Score at Coquina Beach AGAIN!! Wow, this place simply is the best long line DTL wavesailing found in Hatteras right now! Who knows though, it could be gone tomorrow based upon our shifting sand conditions here on the islands. Though for now, it simply rocks at Coquina! The closest I could compare would be the north end of Ocracoke a few years ago just outside the mouth of the inlet where long large lines marched in providing excellent DTL wavesailing. However, that area only worked when it was relatively big and often was bumpy due to the currents funneling in/out of the inlet. I am not sure if it is even happening there now since I have not been out there in a while. Whereas at Coquina, I guess it must simply be the land orientation and the combo of SE ocean swell and SSW or S wind direction, along with the awesome outer sand bars found there since mid-summer. 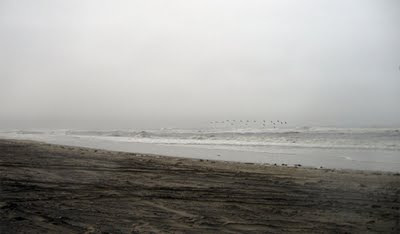 Today, it was ugly from the beach with spitting rain, a messy Lounge with a fair amount of white water, and moderate shorepound. However, once outside, the outer bar (well over 100+ yards offshore on the set wave takeoff) was pure magic! I sailed for three hours straight and it reminded me of the wave conveyor belt in Maui, minus the sunny skies and board trunks! The sets were solid head+ high lines which marched in with 3 to 5 count regularity. I always picked up number 3 or 4 and remained relatively high on the swell face for the upwind ride. Once at the takeoff, it was simply long, smooth, big wave faces, with crumbly sections for the hit! If you were conservative, you could ride the big ones effortlessly, with a minimum of 4 to 5 turns before the kickout on butter smooth faces. If you got a little more aggressive, you could go deep into the bottom turn, and approach the steep lip, but the giants were gentle, and re-entry was no problem. I did not go down on any of the big ones, but I could definitely feel some power under the 92 Tempo as I re-entered down the crumbly section after a hit, and dropped back out ahead of the section ready for another bottom turn. Simply awesome out there!! Definitely the shifting set up of your sand bars down there seem to be swinging to Coquina right not. Great you’ve been scoring. Assateague has been firing every weekend too. I’m outta of my mind at how fortunate I’ve been. It just doesn’t stop. 5.0 or better every weekend since October. Every weekend, its another lo pressure just firing it up..
Yea! I am bummed though that WindGuru does not have any S wind forecast for the near future. Hopefully though there will be another round before I travel north for the holidays! Definitely, the next time at Coqunia, I will take the GoPro and head strap. Sooo bummed I did not take it out yesterday, but I was psyched to get out there, and with the nasty weather I did not think it would capture much. Though given what I saw/experienced out there, the GP footage would have been cool, especially with the head mount. Definitely next time! Bill, Are you around between Christmas and New Years? I may have to come out for Coquina if the right conditions happened to line up that week. I will be out of town for the weekend following Xmas, but will be back and in town through New Years. Yea, keep an eye on the WindGuru models and a SSW/S wind and SE swell forecast. If these two come together again, Coquina will fire! Its been happening every time this setup occurs, and the major fun factor depends how big the swell is?! Note though with the crumbly, gentle nature of the bar wave at Coqunia under these conditions, overhead is not too much trouble. Only shorepound and current may be an issue just off the sand, but that area is quite small in size relative to the Lounge at Coquina. Man this is such a great post. I'm jonsin to get on some long line big face waves! !